Sommelier Ron Rocher and his wife, Jill Lawson, opened Vine to Wine Tours in 2014. They offer customized wine-tasting experiences from Osoyoos to Penticton in British Columbia. This region, called the Okanagan Valley, is defined by the basin of Okanagan Lake and the Canadian portion of the Okanagan River. The mild, sunny climate is amenable to a rich agricultural tapestry of orchards and vineyards. And for the oenophiles, the region contains over 100 wineries. Rocher and Lawson keep their tour groups small to provide a personal experience on each outing. To create the customized experience, Lawson asks incoming guests at the time of booking about their wine knowledge and preference. “We book wineries based on where our guests' interest lies,” said Rocher. Each winery visit is specifically booked for an hour. “Jill and I create memorable days. I don’t call it a tour, I call it an experience,” Rocher said. “If I were on a wine tour with Jill, I would want exactly what we do.” The experience includes a relaxing day learning about the wineries and their specialty wines, plus a scheduled lunch stop: either picnic-style at a winery mid-day or a designated stop to see their Red Seal Chef Chris Van Hooydonk at Backyard Farm for a private lunch. When guests book with Vine to Wine, they receive a VIP experience at the wineries. “When we go to a winery, our guests are greeted by the winemaker themselves,” Rocher said. The winemaker spends an hour with the guests, talking about the philosophy of their winery: why they grow their grapes in a specific way, why they chose their winemaking techniques, even the reasoning behind the setup of their tasting room. Vine to Wine groups move onto a private tasting, during which they hear the story behind each wine they try. Sometimes, the winemaker signs purchased bottles. “People are blown away by our tours,” Rocher said. They are most rewarded by their guests’ reactions long after the tour. They often receive thank you messages as past guests enjoy wine at home that they purchased on his tour. “They call it a wonderful experience,” he said. Rocher chooses his wineries carefully. “The reason why I like these three (see below) so much is because they care more about the quality of wine than the quantity,” he said. He also chooses wineries that align with his own inclusive approach to wine. “The big thing for me with people who are new to wine is to take out the intimidation factor,” Rocher said. These wineries know how to make their guests feel comfortable. These boutique wineries are not certified organic because it costs too much to be certified, but they all follow organic practices. They are all within a 10-minute drive of each other around Osoyoos and Oliver. 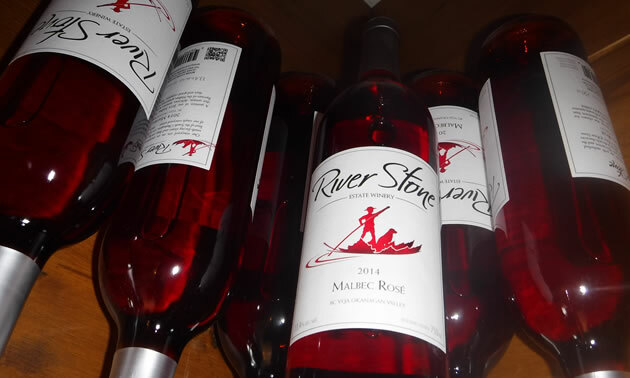 River Stone produces 2,600 cases each year, with 12 bottles per case. Their specialty wine is a red Bordeaux blend they call the Corner Stone. A Bordeaux blend includes Merlot, Cabernet Sauvignon, Cabernet Franc, Malbec and Petit Verdot. The winemaker is personable and low key, yet creates wines that his guests can’t get enough of. The South Okanagan views perfectly complement the Corner Stone red. 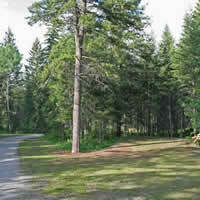 “The setting is absolutely breathtaking,” Rocher said. Don and Michael Bartier grew up in the Okanagan. It made sense for them to return as adults and to plant roots—for grapes, that is. 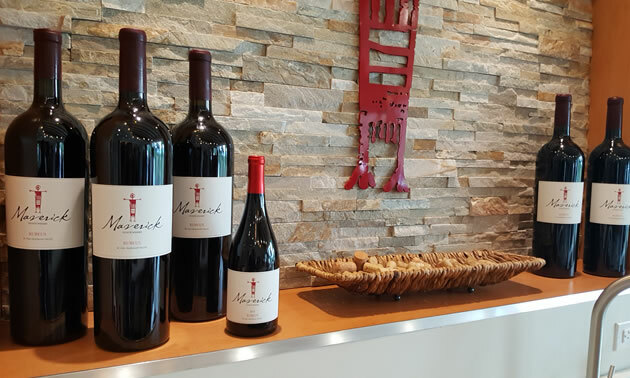 Michael is the winemaker of the duo and has been making Okanagan wine for 25 years. He doesn’t try to mimic well-known wines, but creates delicious bottles from the grapes the Okanagan grows. Most Vine to Wine guests say this is their favourite stop. “In my opinion, he is one of the most talented winemakers in the valley,” said Rocher. Bartier is also a very humble man who treats his guests like gold, no matter their level of wine knowledge. “He considers himself more a farmer than a winemaker,” Rocher said. “The real treat is that Michael uses all wild ferment to produce his wine. They do not produce wine with any commercial yeast,” said Rocher. Wild yeast is the indigenous yeast that exists in the vineyard. It is more unpredictable than cultured yeast, but is specific to its own vineyard. 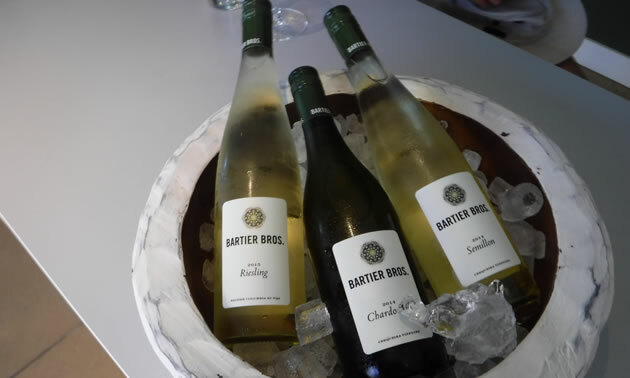 Again, Bartier Bros. offers great value for the price, and the white wines are especially popular. “His white wines are incredibly sought after in restaurants in Vancouver right now,” Rocher said. Current whites include Gewurztraminer, Semillon, an unoaked Chardonnay and a barrel-fermented Chardonnay. “He can’t make enough!” said Rocher. Bertus Albertyn, the winemaker at Maverick, doesn’t care about what people think about winemaking. “He just makes his wine the way he wants to make his wine,” Rocher said. Albertyn also uses wild ferment to produce his wines. The rest of his process adopts similar “old-world” techniques. “The only technology he uses in his winemaking is refrigeration,” said Rocher. Following old-world techniques, Albertyn even foot stomps his grapes that he harvests from bush vines. “These are traditional vines that produce beautiful red wine,” Rocher said. “There are only four bunches per vine, and four bunches make one bottle of wine.” Each year, Albertyn produces 5,500 cases. His red is 100 per cent bush-vine Syrah, sold at a price that Rocher believes to be another amazing value. Also, Rocher always tells his guests that there is no pressure to buy wine while on a tour. Buy wine that you love instead. And only try wine that you want to try. If you don’t like red, don’t feel pressured to try any red. “I try to make people feel comfortable,” he said. He pays attention to his guests so he can help the winemaker guide the tastings. Third, a wine tour should be more than a transport service. “People rush around enough in their everyday lives,” Rocher said. “The last thing we want to do on their wine tour is rush around. 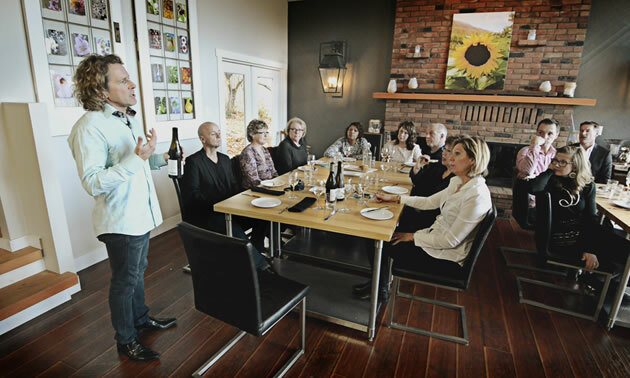 We like them to be slow paced with a food component as well.” Some wine tours transport thousands around the Okanagan between April and October each year. Vine to Wine gave about 275 people an experience to remember last summer. Essentially, when choosing a wine tour or visiting a winery on your own, be open to learn, but don’t feel pressured to try or buy.